Illumination is a vital part of any industrial operation and touches on key aspects of production including productivity, safety, efficiency and morale. With many operations running during both daytime and nighttime hours, and workers putting in ever longer and more difficult shifts, a dark and poorly illuminated workspace can pose a significant issue for companies attempting to maximize performance. With reduced lighting levels or poor or improperly installed fixtures come problems in the form of increased rejection rates, reduced production levels, increased instances of injury, and even problems with retaining personnel. Facilities in the petrochemical, food processing, and fabrication fields face additional problems with added hazards produced by the materials and byproducts inherent to their operations. Flammable gases, vapors, dusts, liquids and chemicals all pose particular fire and explosion risks that must be addressed through increased safety measures, including the addition of lighting equipment designed for use in environments containing these materials. 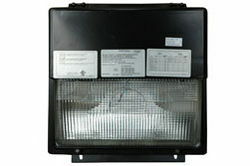 Such lighting equipment is commonly known as "explosion proof lighting" or "intrinsically" safe lighting. Any electrical equipment to be used in a hazardous location must be designed to protect against the accidental ignition of flammable compounds and materials. To understand how and why work environments may be classified as hazardous and how lighting must be chosen according to the hazard presented, it is necessary to look at how environments are classified and how equipment is matched to classification. Hazardous locations are divided into classes according to the type of materials contained within them. Class 1 - Flammable Gases and Vapors. Class 2 - Combustible and electrically conductive dusts. Class 3 - Fibers and flyings such as wood chips. Class 3 is a singular designation and is not subdivided with groups. Classes are further subdivided into groups according to the explosive potential of the materials encountered. Groups A through C refer to gases and vapors, and groups E through G refer to combustible dusts. Materials are grouped according to their physical properties ie gases/vapors, and explosive properties ie, their potential explosive power. Thus, group D for example can be listed as “Gasoline”, yet include other petrochemicals with similar explosive potential. Group A -refers only to Acetylene which has an extremely high explosion pressure. Group B -refers to Hydrogen, gases with more than 30% hydrogen by volume, butadiene, and other gases with similar explosive properties. Group C -refers to ether, ethyl, and ethylene gases, and other gases of a similar potential. Group D -refers to gasoline, acetone, ammonia, benzene, butane, methanol, propane and other more commonly encountered compounds. There are no groups specific to Class 3. Division 1 -refers to the presence of the hazardous material during normal operating conditions and indicates that a hazardous condition is expected to exist all or most of the time. Division 2 -refers to the presence of hazardous materials under abnormal conditions, such as during container failures, leaks or system failures. In this case, a hazardous condition is not expected to exist at all times and only under unusual conditions where hazardous materials would not normally be exposed to equipment. Additionally, equipment is also classed according to operating temperature, which denotes the maximum surface temperature of the equipment. Operating temperatures are important as they relate to the ignition temperature of different materials, and equipment must be chosen which will operate below the ignition temperature of compounds expected to be encountered. For a full explanation of temperature codes, see our article “IECex/ATEX and North American NEC HAZLOC Equipment Classification”. As can be seen, there is a clear and concise list of criteria by which lighting equipment for hazardous locations must be chosen. The most important concept to understand here relates to safety and compliance, and that is that any lighting equipment to be used in a hazardous location must carry the proper approvals and certification according to classification. Any electrical equipment that does not carry the appropriate approvals is not in compliance and as a result poses a serious threat of causing inadvertent ignition of flammable materials or atmospheres. For productivity and improved morale of personnel in the workplace, it is also important that lighting not only be powerful enough to illuminate the workspace, but of a good color and the proper intensity. For instance, lighting with poor color rendering properties is a poor choice for work spaces where close work and color reproduction is critical to production. For close work such as inspection and detail oriented tasks, lighting which accurately reproduces the color of wires, boards, schematics and the like, reduces the probability of errors as well as helps to reduce worker fatigue from excessive eye strain and concentration difficulties. Lighting should not be excessively bright or intense as well, but instead balanced to provide good coverage without excessive dark areas or shadows. Brighter is not always better, and the more comfortable the lighting level, the easier it is for workers to concentrate on the task at hand without added distraction or stress from overly intense illumination. Another factor which has gained popularity in recent years is lighting which more closely matches the full color spectrum much as natural daylight does. Studies strongly suggest that lighting which more closely resembles natural daylight improves worker morale and productivity, reduces fatigue and stress, and helps to maintain a more natural waking and sleep cycle. For large areas and general illumination, lighting with a good range of the natural light spectrum in its output is preferable. There are a whole host of considerations to be accounted for when planning illumination for the industrial workspace. Everything from productivity to safety relies on effective lighting, and it is more important that lighting be chosen specifically to meet clear criteria rather than applied in an effort to simply provide as much light as possible as is commonly attempted.